A devastating flood swept through the Jiwaka province in northern Papua New Guinea. Some villages were swept away by the flood waters, and at least three people are determined to have died in the destruction. 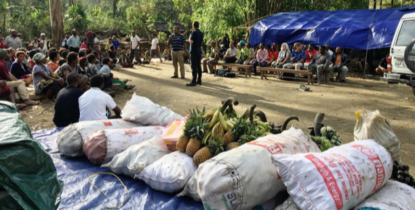 However, the Nazarene Compassionate Ministries in the Jiwaka North District has responded to this crisis with faithfulness and compassion. 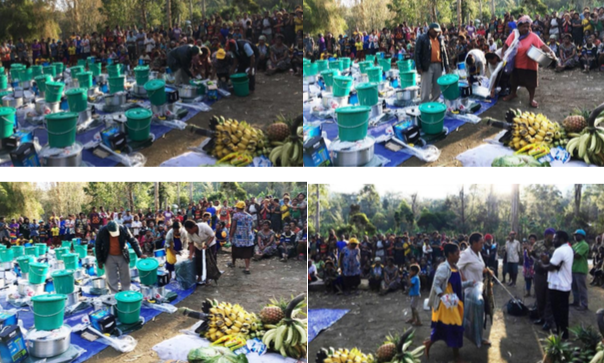 Throughout the Jiwaka province, a total of 45 households have been assisted with food, tools, and other supplies to begin the long rebuilding process. Jiwaka North District, including District Superintendent Andrew Akus, district advisory board members, pastors, and Christians who contributed. Rotary Club of Boroko for donating a total of 25,000.00 PGK for important tools and supplies through the Brian Bell Company PNG. Brian Bell Company PNG for the huge discount on the invoice that was initially valued at 46,000.00 PGK. This discount enabled NCM to fully satisfy a total of 45 family households. Regional NCM Coordinator John Watton for his timely presence during the time of distribution, and for speaking the word of God on the compassion of Jesus in a very timely manner. Thank you for being a vessel of God. Aprup Nazarene Church pastor and Christians, who through the pain rose up in compassion to help not only Nazarenes but also the community in general. They have been true ambassadors of Christ through your compassionate heart. Community leaders for being very supportive and understanding and for cooperating with the church to make this happen. Thank you for maintaining normalcy and calm during the time of distribution. Melanesia South Pacific NCM for initiation, coordination, advocacy and taking the lead in planning and taking care of all logistical needs.